Yeah will have been Silverstone. Enjoyed the footage on board with you at Silverstone (I think?). Really enjoyed that. A clever bit of editing. The dice between the yellow and white cars looked very close! Shame about that spin - going well and making up some places before then! 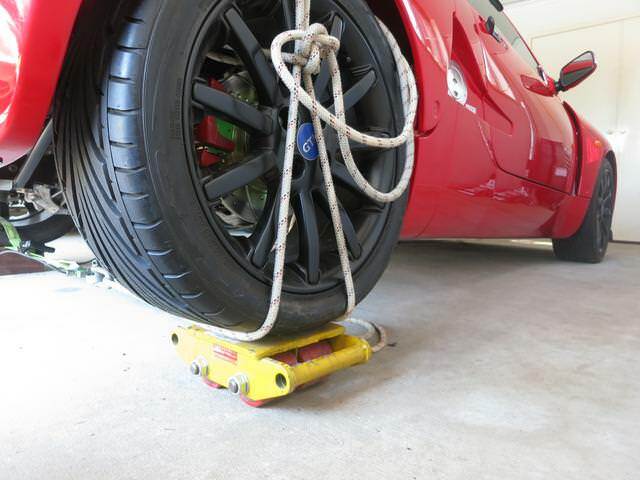 So I finally got around to measuring the rear camber compliance on the Spyder. 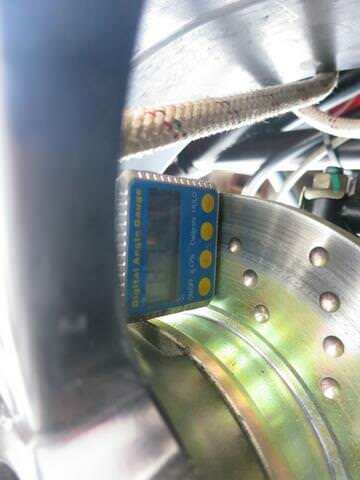 I used a load cell and digital readout to measure the force and a small magnetic digital level attached to the brake disc to measure camber gain (loss of negative camber). A ratchet strap supplied the force which was applied to the bottom of the tyre and reacted at the bottom of the tyre on the opposite wheel. So each wheel felt like it was the outside wheel in a cornering situation. One tyre was on a "roller skate" to allow free lateral movement and the other was on a block of equal thickness. The suspension is brand new Mk II so there is no free play in any joints or wheel bearings. 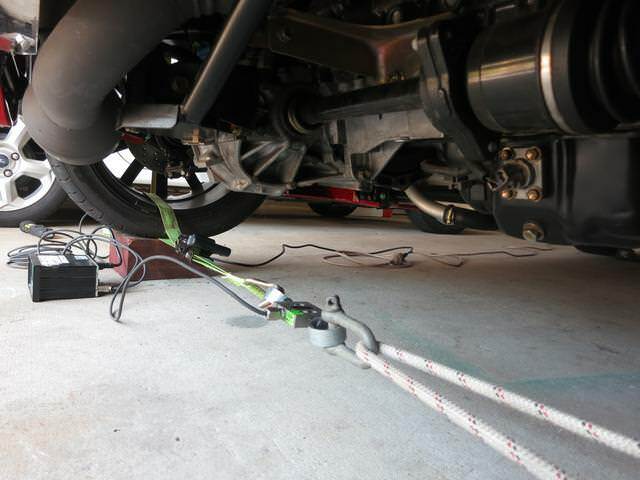 I repeated the experiment on the front suspension for reference. The results are shown in the chart which combines data points for left and right wheels. I charted them separately but there was little difference side to side so I haven't posted that. 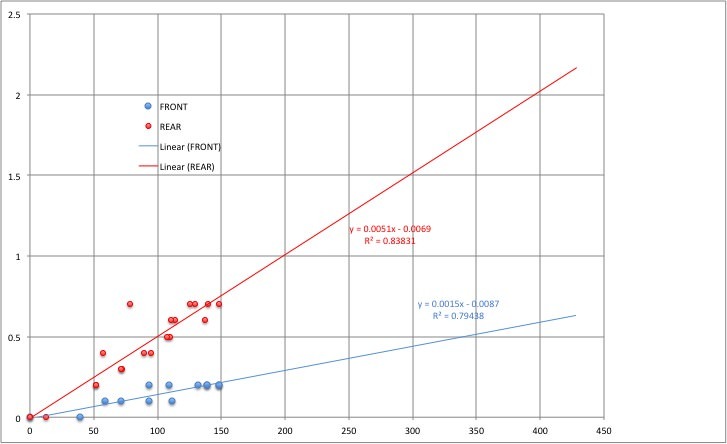 The best-fit lines are excel trendlines and I extrapolated them to the sort of cornering force you might see on a rear tyre at 1G cornering with most of the weight transferred to the outside tyre. In summary, the rear suspension loses about 0.5 degree of camber for each 100kg of cornering force which could add up to 2.5 degrees in extreme cornering. The front has less than one third the camber compliance of the rear, made worse by the fact that the front only sees about 80% of the cornering forces of the rear. As a rough example, consider 500kg cornering force at the outside rear with 400kg at the outside front. The camber loss would be 2.5 degree at the outside rear and 0.6 degrees at the outside front. This is a recipe for oversteer at the limit. The easy fix is lots of static negative camber at the rear but this will wear the tyres unevenly. This would probably be acceptable for a track day setup. The real fix is a new suspension and the Z Cars design would definitely be a lot better - probably a complete fix. 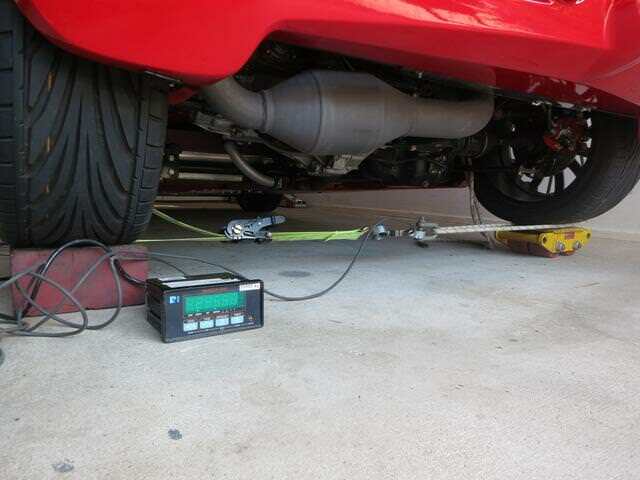 In defense of the factory suspension it does gain negative camber in roll due to its geometry - the Z-Cars does not. I think this gain is only enough to partially offset the camber loss due to the body roll itself ie for 3 degrees of body roll, the GTM suspension might only lose 1 - 1.5 degrees of negative camber (plus the compliance loss) where the Z-Cars suspension will lose the full 3 degrees (with a lot less compliance loss). My plan is to one day build a Z-Cars type suspension but make it a semi-trailing arm version with the pivot axis laid back at about 10 degrees in plan view (BMW's run 12 - 15 degrees). This will give some negative camber in roll without too much toe change. Finally - I hope someone wants to repeat my experiment on their Z-Cars rear end. It would be very interesting to know how good it is. The ideal would be for the rear camber compliance to be no more that 80% of the front ie about 0.0012 degrees/kg (or less). Last edited by Spider on Sat Sep 29, 2018 12:25 pm, edited 1 time in total. Mine is mark 1.5 rear suspension (land rover track rod ends rather than pillow joints). From comparison with a friend's mark 2 I believe mine has a bit less compliance but there is no doubt it loses negative camber considerably on track cornering. My evidence is much less scientific though - basically I have some photos that people have taken of me on track from an angle that gives a reasonable perspective of the rear wheel camber. In photos of the car cornering hard the outside rear looks like it has gone into slight positive camber (relative to the plane of the car to discount the roll angle). when I first got the car the rear was set with only about 0.5 degrees of static negative camber and on track photos it looked like about 1 degree of positive and I was finding it very easy to spin! I dialled in 1.5 degrees of static negative and photos now show it only very slightly positive and it is much more driveable but does still snap oversteer when you cross the limit. I don't want to add any more static camber as I find on the road it gets a bit "tramliny" with more and I don't want to be adjusting it back and forth all the time. Recently adding ARB's has made things better again and I just need to grow bigger balls to find the limits now!! The other impact of the compliance is that toe-in reduces under load. Did you measure that? When set parallel it goes to toe out and that also contributes to the tendency to spin!! I've found a relatively small toe in sorts that out though. It's worth noting that at least some of the movement will be in the rear bulkhead. Through production the thickness of the bulkhead varied quite a lot. I believe the Spyder had a thicker rear bulkhead than the Libra due to the lack of roof. The Z Cars suspension of course removes this flex with the large beam across the bulkhead. Some owners have linked the standard suspension brackets with a steel box section across the bulkhead to help remove some of the flex. I forget what the movement was in all the joints when analysis was done in the TGTM days but from memory about half the overall was the bulkhead. I didn't measure toe change under lateral load but I would be surprised if it is that bad. The factory geometry adds toe-in in bump which would help. The Z-Cars rear would toe out slightly under lateral load. Is that your Spire for sale on fleabay Ryan? what are your plans for next season?